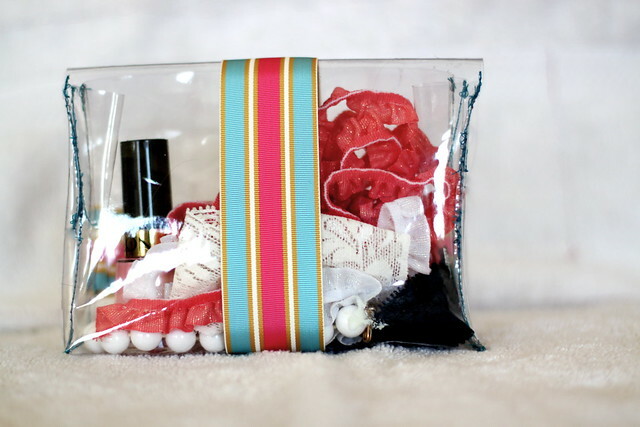 The "All Dolled Up" Tote. The perfect gift for any girl. You can see exactly where everything is in there. 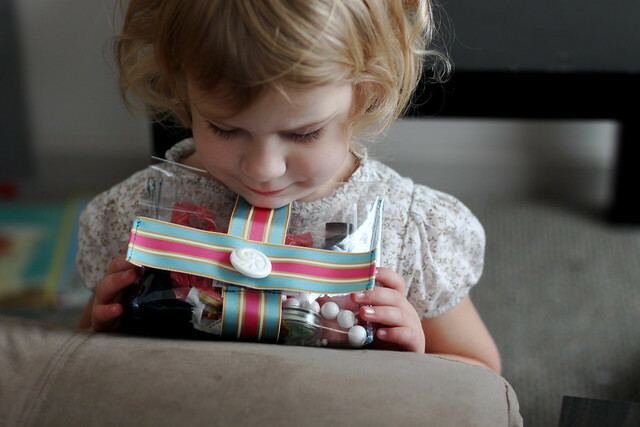 It is dainty and small, closes with velcro, and is already being loved by Johanna. 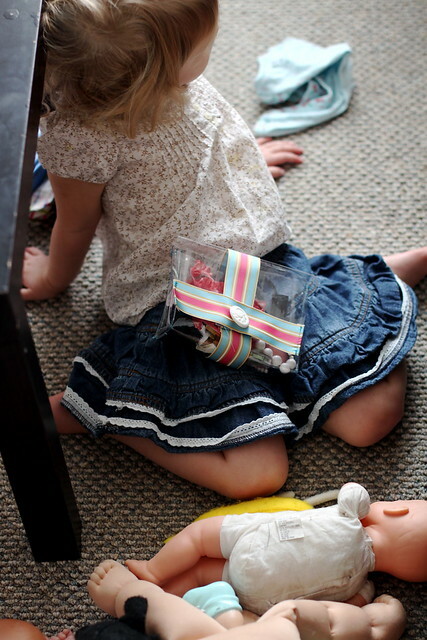 Johanna calls the bag her "Mommy bag" since she plays mommy all day to her 8 or so baby dolls. Be prepared. 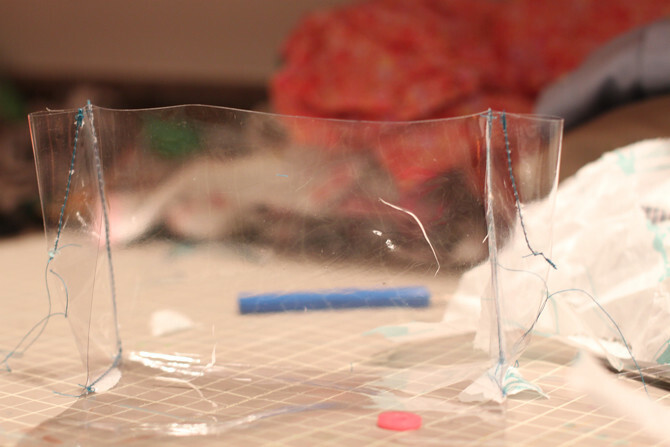 This coud be a tricky tutorial since we're working with a clear material. I'll try to be very descriptive since the photos could be confusing. 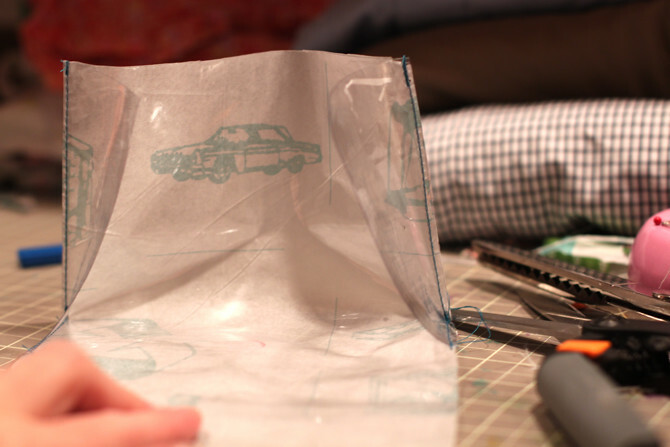 The basic construction of the tote is one long piece of vinyl (which will be the front, bottom, back, and flap) and the two side pieces. Fall back on that concept if you get confused. 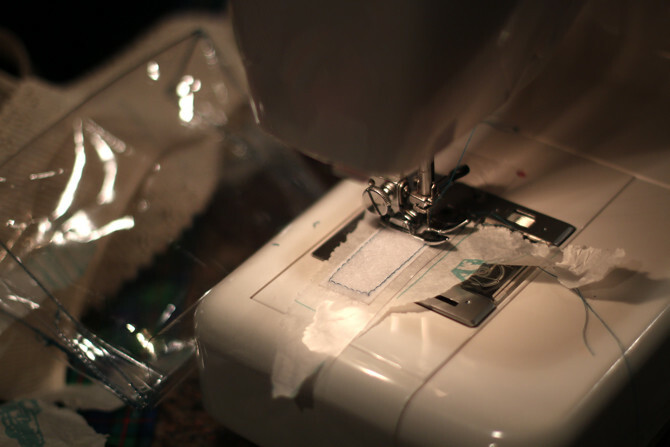 Remember: when sewing with vinyl, your machine will be happy if you always have tissue paper on the bottom of whatever you are sewing. 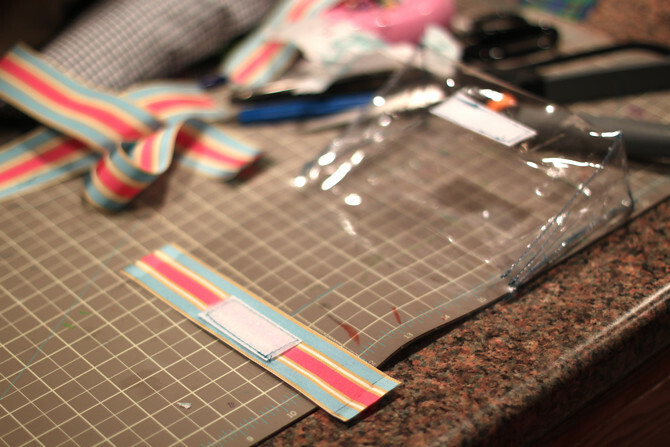 So layer tissue paper then vinyl before sliding your project under the needle. It will slide and stitch smoothly. Thankfully, vinyl comes with its own tissue paper. I just use that as I go. Also, this project needs no pinning because everything you sew has vinyl against vinyl and therefore, clings to each other. Another reason I love vinyl! 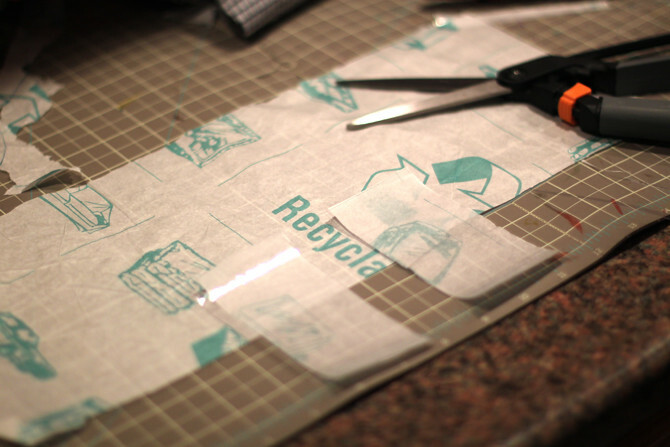 As seen above, sew the two sides of vinyl to the long vinyl's end sides. Now you have two flaps. 2. Now stitch each "flap" to what will become the bottom of the tote. It is easy-- just pinch where you want to start that new side and slide under your machine. Just back that needle right where the last stitch ended and start sewing this new side. It should look like this above before you have finished the last seam for each side. It is like making those paper boxes when we were kids. Remember those? 3. 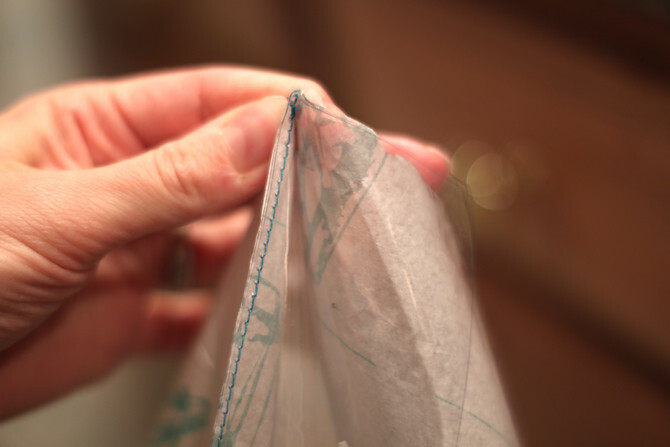 Before you finish the last two seams of the tote, sew diagonal darts in the sides. Simply sew diagonals like the photo above. Once the tote is turned inside out this will keep the form of the bag better. 4. 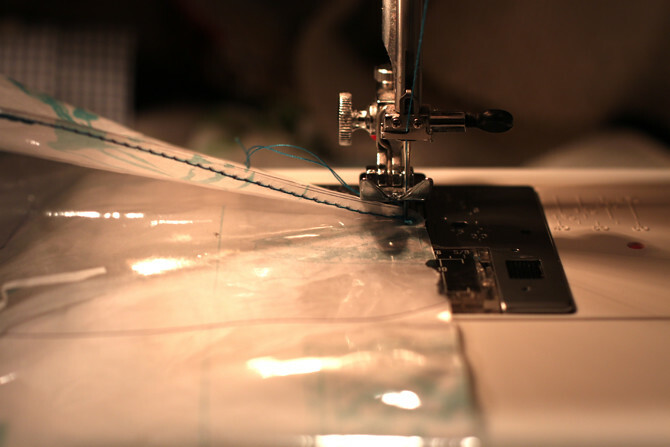 Sew the last seam. Do the same for the other side and its "flap". 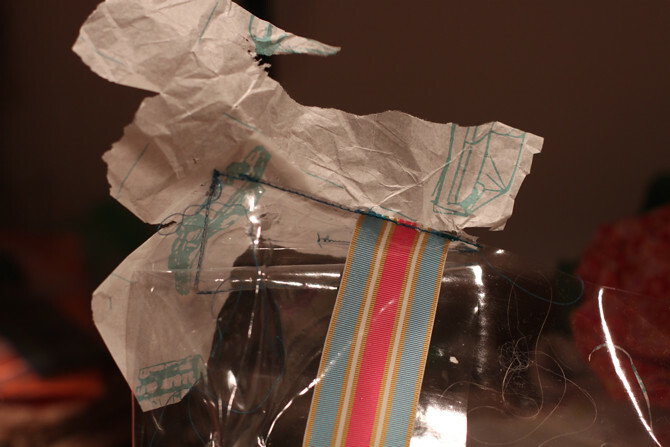 Keep in mind that as you sew over the tissue paper this is what it will look like above. 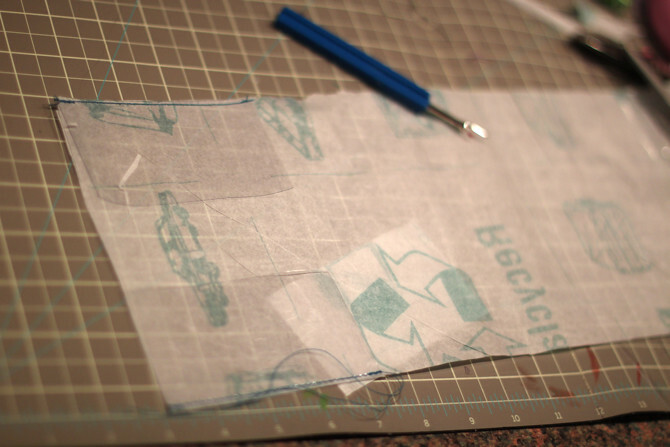 After each stitch, just remove the sewn-on tissue paper. It won't hurt the seam you just created. 5. Flip the tote inside out. Line the velcro up to be at the lower center of the tote. Stitch velcro on the front of the tote and then on the front flap so they match. 6. Stitch the shorter ribbon along the front of the front flap. 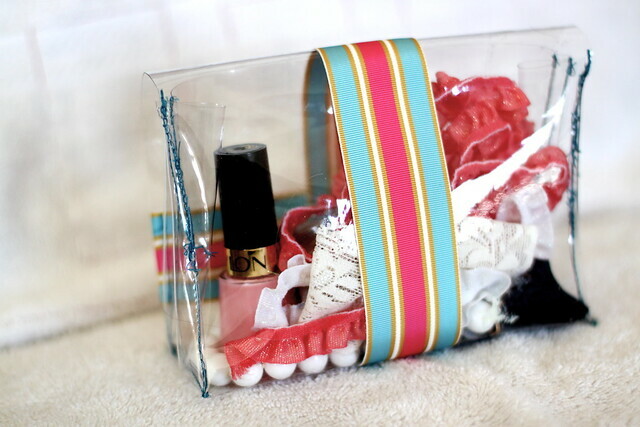 Just wrap the ribbon over the front flap and stitch along the ends of the ribbon. It should cover the vinyl seam and inside velcro beautifully. 7. 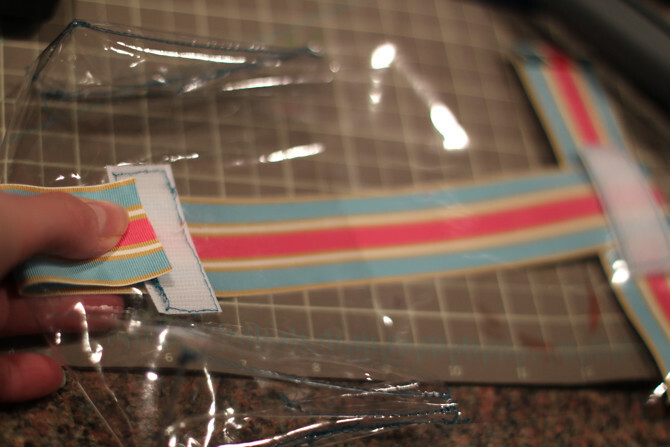 Now sneak the long ribbon under the ribbon you just stitch onto the front flap. 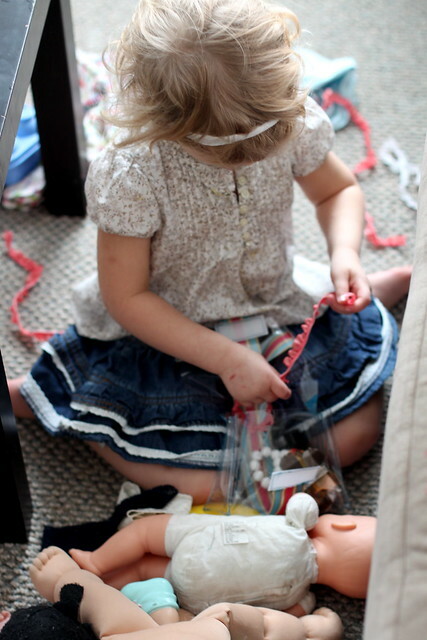 Sew the long ribbon under the short ribbon, perpendicular to it to hide where it begins. No one will see this stitch. Don't sweat it! 8. Now that the one end of the long ribbon is secure, pull the long ribbon taute around the tote until you reach the other velcro. 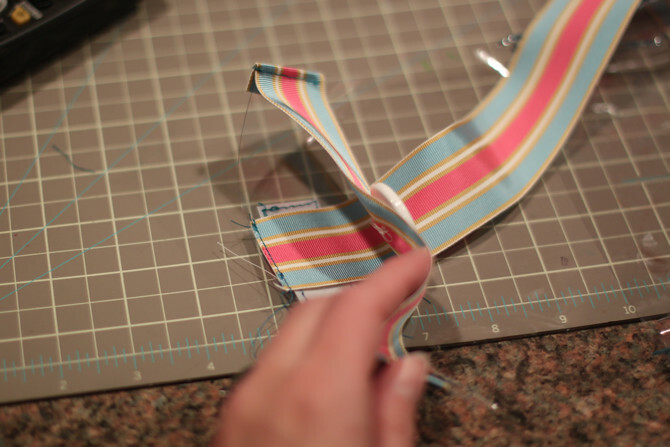 Hold it in place, fold under the ribbon enough to be flush to the velcro, and stitch in place. Now you're tote is complete! I hope you try it out. If you have any questions, please ask. Vinyl is a blast. So are little girls. See you on Monday morning! Happy weekend! Older PostVote for the Sleepy Time Gal!